A mole is a set amount of something, the way a dozen of anything means 12 whether you're talking about a dozen eggs, donuts or months. In chemistry, whether you're talking about the elements iron, sulfur or chromium, a mole of something always refers to the same number of particles such as atoms, molecules, ions or electrons. How many particles? The answer is as many as there are atoms in 12 grams of the isotope carbon-12. Mole, which uses the symbol "mol," is a convenient unit when working with such tiny things as atoms, allowing one to count them in heaps. Establish the relationship between moles and millimoles. There are 1000 millimoles per mole: 1 mole = 1000 millimoles. Another way of expressing the relationship is 1/1000 moles = 1 millimole. The relationship can also be expressed as a fractional notation: 1 mole/1000 millimoles or 1000 millimoles/1 mole. Express the relationship as appropriate to your needed outcome, writing it down. A simple conversion might only call for the equation 1 mole = 1000 millimeters, while a scientific calculation likely calls for you to express the relationship on paper as the fractional notation of 1000 millimoles/1 mole. Calculate the conversion. If using the equation 1 mole = 1000 millimoles, multiply each side of the equation by the amount of moles you are converting. Multiplying each side by the same amount keeps them equal. 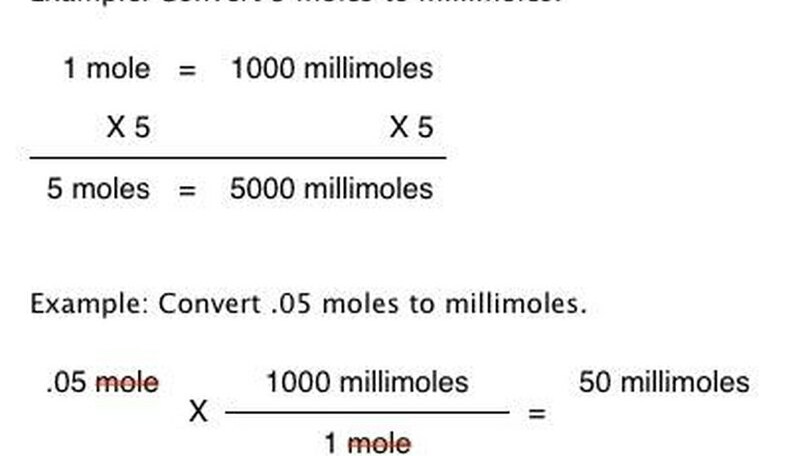 If using the fractional notation, multiply it by the moles you are converting: "y moles X 1000 millimoles/1 mole" where "y" is the number of moles you are converting. In conversions, when using fractional notations in the equation, make sure the unit you are converting to is on top: If converting to millimoles, the notation should list millimoles over moles. If converting from millimoles to moles, millimoles should be on the bottom. According to current measurements, the number of atoms in 12 grams of carbon-12 is 6.0221376 X 10 to the twenty-third power. That value is known as Avogadro's number. Avogadro's number, though used as a constant, could change as methods of measurement grow more precise. It changed in the 1980s from a value of 6.022045 X 10 to the twenty-third power. Remember that mole is defined in terms of the number of atoms in 12 grams of carbon-12 isotope, not Avogadro's number. Johnson, Sophie. "How to Convert Moles to Millimoles." Sciencing, https://sciencing.com/convert-moles-millimoles-4895690.html. 24 April 2017.